According to the Arbor Day Foundation, properly placed trees in the landscape can increase property values up to 20%. While large trees can also provide us with shade, reduce heating and cooling costs and provide beautiful texture and fall color, not every urban yard has the space for one. However, there are many small ornamental trees that can add charm, beauty and value to small properties. As a landscape designer and garden center worker, I often suggest smaller ornamentals for these situations. Newport plum (Prunus cerasifera ‘Neportii’) is one of my first suggestions. Continue reading this article for Newport plum info and helpful tips on how to grow a Newport plum. 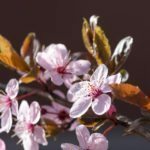 What is a Newport Plum Tree? The Newport plum is a small, ornamental tree that grows 15-20 feet (4.5-6 m.) tall and wide. They are hardy in zones 4-9. 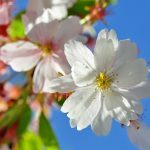 This plum’s popular attributes are its light pink to white flowers in spring and its deep purple colored foliage throughout the spring, summer and fall. Depending on region, rose-pink Newport plum blooms appear all over the trees rounded canopy. These buds open to pale pink to white flowers. Newport plum blooms are especially important as nectar plants for early pollinators like the mason bee and monarch butterflies migrating north for summer breeding. After the blooms fade, Newport plum trees produce small 1-inch (2.5 cm.) diameter plum fruits. Because of these small fruits, Newport plum falls in to a group commonly known as cherry plum trees, and Newport plum is often referred to as Newport cherry plum. The fruit is attractive to birds, squirrels and other small mammals, but the tree is seldom bothered by deer. Newport plum fruits can be eaten by humans as well. However, these trees are mostly grown as ornamentals for their aesthetic flowers and foliage. One specimen Newport plum in the landscape will not produce a lot of fruit anyway. Newport plum trees were first introduced by the University of Minnesota in 1923. Its history beyond that has been hard to trace, but it is believed that they are native to the Middle East. Although it is not a native to the U.S., it is a popular ornamental tree throughout the country. Newport plum is rated the most cold hardy of the cherry plum trees, but it grows well in the south too. Newport plum trees grow best in full sun. They will grow in clay, loam or sandy soil. Newport plum can tolerate slightly alkaline soil but prefer acidic soil. In acidic soil, the ovate purple foliage will achieve its best color. In spring, new foliage and branches will be a red-purple color, which will darken to a deeper purple as the foliage matures. The downside to growing this tree is that its purple foliage is very attractive to Japanese beetles. However, there are many homemade Japanese beetle remedies or natural products that can control these damaging insects without harming our beneficial pollinators.